Mining tycoon Gina Rinehart has triggered a squall of controversy in Australia by issuing a call for the minimum wage to be reduced and accusing those jealous of her immense wealth of being lazy and indulgent. In an opinion piece written for Australian Resource and Investment magazine (paywall) Rinehart recommended that the government reduce the Australian minimum wage to AUD$606.40 a week and cut taxes in order to boost the economy. Rinehart also used the opportunity to pillory those who may be envious of her wealth for their own indulgent lifestyles and lack of work ethic. "If you're jealous of those with more money don't just sit there and complain…do something to make more money yourself–spend less time drinking or smoking and socialising and more time working," said Rinehart. Her comments have already drawn considerable ire, with Australian treasurer Wayne Swan quoted by Fairfax press as saying that Rinehart's comments were "an insult to the millions of Australian workers who go to work and slog it out to feed the kids and pay the bills." The Australian reports that Construction Forestry Mining and Energy Union president Tony Maher has also slammed her remarks, saying that they prove why mining magnates should not lead Australia's economic debate while making pointed reference to Rinehart's status as heir to a mining fortune during an unprecedented boom in the Australian resource sector. 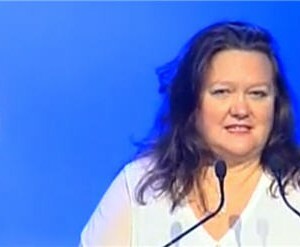 Rinehart is the head of private mining giant Hancock Prospecting and is currently Australia's richest person as well as the world's richest woman. She is the heir to father Lang Hancock's mining fortune and business interests and became Executive Chairman of Hancock Prospecting following his death in March 1992.